Chelsea moved up to 11th after coming back from a goal down to beat Southampton with a late Branislav Ivanovic header. Chelsea manager Guus Hiddink managed Southampton counterpart Ronald Koeman when the pair won the European Cup with PSV Eindhoven in 1988. They later fell out over Hiddink's appointment as Netherlands manager in 2014, although both have said there were no hard feelings. They shared a handshake and a few words before their teams competed in a fascinating match. 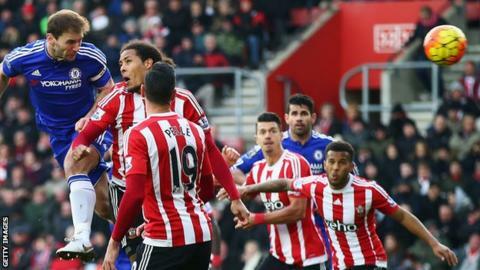 Southampton were initially on top but Chelsea showed they had the greater stamina and capitalised on the home side dropping back too much after the break. Hiddink will not only be pleased with his side's desire and commitment but the fact they recovered from conceding against a team who had not let in a goal in six games. The Blues remain unbeaten in the Dutchman's 11 league games since he took over from Jose Mourinho. Do Southampton have cause for complaint? Southampton had been unbeaten in six league games, including five wins, before this match. Keeper Fraser Forster set a top-flight league record of going 667 minutes without being beaten when the clock reached 34 minutes at St Mary's and, when he did eventually let a goal in, it was in bizarre circumstances. The assistant was flagging for a foul by Chelsea's Kenedy on Cedric Soares but referee Martin Atkinson overruled and Fabregas sent in a low curling cross, which Forster misjudged as it went across him and in at the far post. "I don't understand that. The linesman is the closest to the situation. If it is a fault by Kenedy then you have to listen to the linesman. That's why you have linesmen - to help you," Koeman said. When asked about his view, Hiddink said: "There are many duels and referees in England usually let a lot of duels go." Chelsea manager Guus Hiddink: "I think it was a deserved win for us. They haven't conceded in the last six, seven games so it was successful for us. "We had a setback when we went 1-0 down - it was a present from our defence - but we did very well in the second half. We were well organised and then got the goals." On replacing Baba Rahman, whose mistake led to Southampton's goal, at half-time: "I don't want to make a fake injury. I took him off because of the error. He has to cope with that. He was very down in the locker room about his mistake, but we have to make decisions like we did." Shane Long has scored in back-to-back Premier League games for the first time since he did so for Hull City in February 2014. Southampton have led in 10 Premier League home games this season, the joint-most along with Chelsea. Fraser Forster conceded his first goal in 708 minutes of Premier League action. Cesc Fabregas scored just his third goal in his 40th appearance this season and his first away from Stamford Bridge since scoring at QPR in April 2015. Reigning champions Chelsea have won back-to-back games for the first time this season and the first time since May 2015. Chelsea face another away trip as they travel to Norwich for a top-flight game on Tuesday (19:45 GMT), while Southampton are at Bournemouth the same evening. Match ends, Southampton 1, Chelsea 2. Second Half ends, Southampton 1, Chelsea 2. Offside, Southampton. Cédric Soares tries a through ball, but Sadio Mané is caught offside. Substitution, Chelsea. Nemanja Matic replaces Eden Hazard. Offside, Southampton. James Ward-Prowse tries a through ball, but Sadio Mané is caught offside. Substitution, Southampton. James Ward-Prowse replaces Matt Targett. Goal! Southampton 1, Chelsea 2. Branislav Ivanovic (Chelsea) header from the centre of the box to the centre of the goal. Assisted by Willian with a cross following a corner. Corner, Chelsea. Conceded by Oriol Romeu. Attempt blocked. Kenedy (Chelsea) left footed shot from outside the box is blocked. Assisted by Willian. Attempt saved. Graziano Pellè (Southampton) right footed shot from outside the box is saved in the centre of the goal. Assisted by Sadio Mané with a headed pass. Attempt saved. Oscar (Chelsea) right footed shot from outside the box is saved in the top centre of the goal. Assisted by Diego Costa. Offside, Chelsea. Kenedy tries a through ball, but Eden Hazard is caught offside. Attempt missed. Willian (Chelsea) right footed shot from outside the box is close, but misses to the left. Assisted by Oscar. Substitution, Southampton. Sadio Mané replaces Charlie Austin. Attempt missed. Kenedy (Chelsea) right footed shot from outside the box is high and wide to the right following a corner. Corner, Chelsea. Conceded by Steven Davis. Attempt blocked. Diego Costa (Chelsea) left footed shot from the centre of the box is blocked. Assisted by Willian. Goal! Southampton 1, Chelsea 1. Cesc Fàbregas (Chelsea) right footed shot from the left side of the box to the bottom right corner. Assisted by Diego Costa. Oscar (Chelsea) wins a free kick in the defensive half. Substitution, Southampton. Graziano Pellè replaces Shane Long because of an injury. Attempt missed. Virgil van Dijk (Southampton) right footed shot from outside the box is close, but misses to the left. Assisted by Oriol Romeu. Corner, Southampton. Conceded by Branislav Ivanovic. Offside, Chelsea. Cesc Fàbregas tries a through ball, but Gary Cahill is caught offside. Jordy Clasie (Southampton) is shown the yellow card for a bad foul.